A BIG heart and a warm smile will always welcome you at Turangga Farm and at the stud’s famous Inglis Easter Sales marquee, where a signature steak and glass of good red awaits, along with your no-nonsense yet effervescent host, Stuart Ramsey. Based in the Segenhoe Valley near Scone, Turangga Farm, which means ‘horse’ in Indonesian, has long been home to top quality bloodstock. Stallions who stood there in earlier years include Taj Rossi and Twig Moss (FR). Since the property was purchased by Ramsey Pastoral in 2003, we’ve seen a plethora of black type winners come off Turangga, led by Hong Kong Champion Able Friend, Sky Cuddle, Headway and Karuta Queen. Here, we learn more about the man behind Turangga’s success, Stuart Ramsey, his life-changing events, racetrack triumphs and plans for the future. Q: Stuart, most people in the industry know you’re a self-made pastoral mogul and respected horse breeder who loves a good steak, medium rare of course, a red and a chat. What’s your back-story? A: “Being a kid in Casino I grew up with horses and cattle, so the interest has always been there. My father was a local butcher and I did a lot of work with him after school, on Saturday’s and school holidays in between going to pony club or riding track work as a teenager. “After leaving Casino High in Year 10 and going to college, my career began at Elders as an auctioneer. After that I started my own stock agency, bought a property at Condobolin, and got married in 1978, but we eventually sold that property and moved back to Casino. In 1985 I then went into buying, selling and processing cattle from abattoirs, which grew quickly from Casino, to Wagga, Forbes, Gunnedah and eventually Grafton. Q: When did things start taking off with the thoroughbreds? 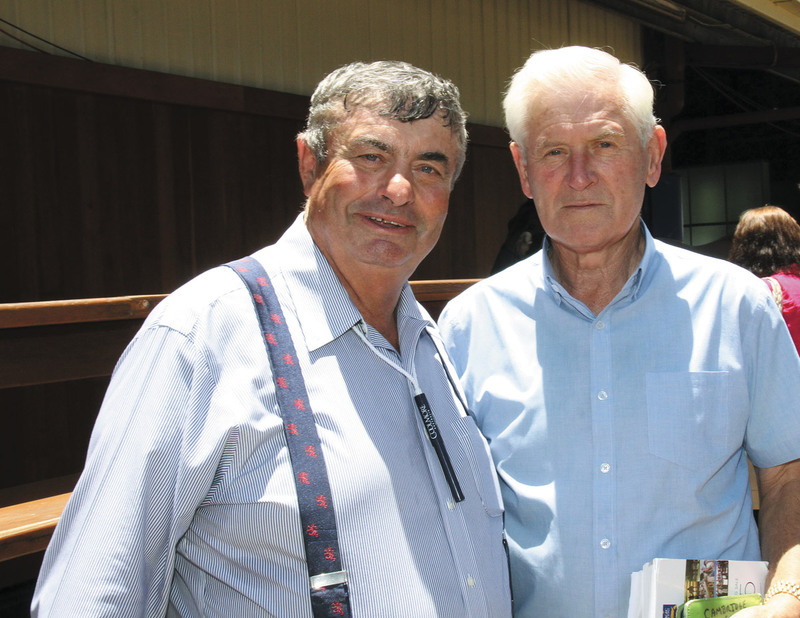 A: “I raced my first horse in 1976, one I leased with a mate Geoff Boal. His name was Lewmac and he won the Wonboyn and Coleambally Cups in NSW. In 1978 I bought a few cheap horses with my friend Lenny Peck, from the Inglis tried horses sale, and we got a lot of success out of it and it just grew slowly from there. Q: You got even more serious in 2003 and purchased 283ha (700 acres) in the heart of the Hunter’s Segenhoe Valley, known as Turangga Farm. What was the objective, and how did you build it to be the success that it is today? A: “I wanted to build a boutique thoroughbred farm with my family, and the opportunity came up to buy Turannga. Considering the history of the place for producing good horses and the general set up, we jumped on it because we’d been looking for a while for the right sort of property. The plan was to run it as personal boutique stud, rather than one with client horses on it, so my son John and I really had a crack from there onwards. “Today we’ve got between 75-80 broodmares (by the time we sell a few mares) and wean about 50-60 yearlings per year which we then prepare for the major sales at Inglis and Magic Millions. Any yearlings we don’t sell or purchase a share in, we’ll race in our green, yellow and white colours. Q: Speaking of racing in the green, yellow and white colours, you’ve been lucky enough to own some handy ones over the years including Gr.1 mares Ancient Song (2003 Salinger Stakes), Sky Cuddle (2004 Emirates Stakes) and Cinque Cento (2007 Doomben Cup). Q: Breeding a Gr.1 winner is a dream for any breeder, and Mr Murphy was your first in 2001, how satisfying was that? Q: What have been some of your other key successes? Q: You’ve set a couple of impressive sale records in recent years, which is not a bad effort for a boutique farm! A: “Thank you. We sold Kangarilla Joy (Lonhro-Midnight Joy by Zeditave) as a yearling in 2014 for $840,000, which was a new record for a filly by her sire and the other was the $1.6m Sepoy colt out of Ancient Song (Canny Lad), who set a southern hemisphere record for a first season sire yearling last year. We were very lucky, but the staff also put in the long hours to get them in good order and parade so it’s a great achievement for everyone involved. Q: You’ve managed to take a step back from the day to day running of Turangga Farm now. How do you find the right balance working with family? A: “I’ve seen so many kids ruined by up from overbearing fathers and grandfathers. You’ve just got to give them a chance in life and let them do it their way sometimes, so I’ve made an effort to step back and let John take the reins. Everyone knows John and I have had our rows, but he’s doing a good job and I’m giving him the space to do it. Q: Unfortunately the Ramsey family suffered a tragic loss in 2007 when your 18 year-old daughter Sherilee unexpectedly lost her life through natural causes. How did you deal with such a life-changing event and how did it change your perspective on life? A: “First of all you’ve got to keep the family together. You see, so many families lose a child and then break up. It’s one of the reasons why I sold the abattoir and meat-trading business, because I wanted to be around my wife, kids and grandkids more. You get a different outlook on life, and it changes you immensely. Life’s no longer all about work and making money. I’ve since tried to slow down, live each day as it is and travel a bit. Q: Two weeks after Sherilee’s passing, Cinque Cento saluted in the Doomben Cup-Gr.1 for you, and you also bred Champagne Stakes-Gr.2 winner Keiki and Doomben Roses-Gr.3 heroine Lasoron on the same card. What a day to remember. A: “It was a pretty special day . . . very special. You just don’t get days like that too often. Winning any Gr.1 race is good, but this was a bit more special after what had happened. Words can’t describe it. Q: You’ve got a great love for the Australian landscape and cattle haven’t you? Q: What career advice would you give to those starting out in the thoroughbred industry? Q: Are there any Turangga-bred or owned horses we should follow this season? A: “The Virginian has turned out to be a good horse, although he’s best suited for the autumn. He won his maiden and ran third in the Stradbroke to Under the Louvre and Black Heart Bart at just his fourth start. Q: What does the future hold for Turangga Farm? A: “We’ve spent a lot of time over the years building up a quality broodmare band and matching them to the right type of sires so we take pride in producing top quality yearlings for sale each year at Magic Millions and Inglis. We’ve stood a couple of stallions, Zizou the most successful, but decided to focus on broodmares and yearlings because it’s too hard to compete in the stallion business with the bigger farms. We do hold shares in a few stallions if we can, and at the moment we’ve got shares in All Too Hard, Vancouver, and Nicconi, so we naturally support these guys with some of our mares.